RUBY LEDBETTER PLUMLEE, a resident of Emerald Beach, MO, was born December 28, 1925 to John and Grace (Berkes) Ledbetter. 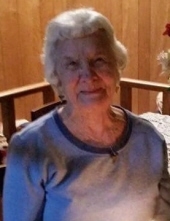 She departed this life February 3, 2019 in Eureka Springs, Arkansas at the age of 93 with her boys by her side. On January 27, 1946, Ruby married Wayne Edward Plumlee, the love of her life. Their life together included farming, partners in the Plumlee/Callen Grocery Store in Oak Grove, Arkansas for over thirty years and the trucking industry. Ruby was a homemaker and her family was her world. Ruby loved playing with her flowers and anything that had to do with the outdoors. In her later years, making sure her birds were fed and her solar lights were working kept everybody “hopping”. Ruby was of the Baptist faith, even though she didn’t attend church, she had a strong faith and firm belief in the power of prayer. Ruby was preceded in death by husband, Wayne in 2013; her parents John and Grace Ledbetter; two infant daughters; two brothers, Harold and Cleo Wright and sister Margaret Brandt. Ruby is survived by her two sons, John and wife, Rowena Plumlee of Golden, Missouri and Jim and wife, Donna Plumlee of Green Forest, Arkansas; two grandchildren, Jimmy Ray Plumlee and wife, Gena of Seligman, Missouri and Penny Plumlee McBryde and husband, Matt of Emerald Beach, Missouri; five great-grandchildren; three great-great grandchildren; several nieces, nephews and other family and friends. To send flowers or a remembrance gift to the family of Ruby Ledbetter Plumlee, please visit our Tribute Store. "Email Address" would like to share the life celebration of Ruby Ledbetter Plumlee. Click on the "link" to go to share a favorite memory or leave a condolence message for the family.